Follow the CRA gift tax rules and give your employees gifts instead of cash bonuses and both you and your employee will benefit on your Canadian income tax. Employers can use the total cost of the gift as a tax deduction, and employees don't have to declare the cost of the gift as part of their taxable income. Employees may receive up to $500 (in fair market value) of non-cash gifts in a year. Employees may receive a non-cash gift in recognition of long service valued at less than $500 once every five years. Employer-provided parties or social events where the cost is $100 per person or less. Meals or other hospitality services at work-related functions, such as meetings, training sessions, etc. Valueless items such as coffee/tea, snacks, mugs, t-shirts, hats, etc. The annual and long-service awards are considered to be separate, that is both may be received in the same year. Anything above the $500 amount in either case is considered to be a taxable benefit, for which the employer may have to make source deductions (for a complete list of taxable benefits and source deductions see the CRA's Benefits and allowances chart). Small gifts don't count. Mugs, chocolates, plaques etc. are not included in the $500 limit. Rewards that involve employer-provided meals or accommodation. For example, as a bonus you send an employee and his family on a trip to Disneyland. Cash or non-cash awards from manufacturers given to dealers that are passed on to employees. Points for travel, accommodation and other rewards. Gifts given by manufacturers to employees of dealerships. "A gift has to be for a special occasion such as a religious holiday, a birthday, a wedding, or the birth of a child... If you give your employee a non-cash gift or award for any other reason, this policy does not apply and you have to include the fair market value of the gift or award in the employee's income." However, a tax break is a tax break, and as long as you stay within the restrictions, this Canadian income tax policy on employee gifts could make calculating those T4 slips a little easier and provide a nice tax deduction for your business. It is fairly common for employers to provide stock options, stock purchase plans, or bonuses in the form of stock in the company to employees as a benefit. 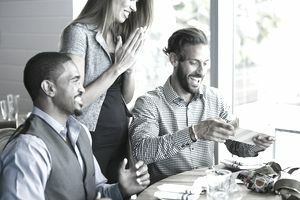 It is generally viewed as a win-win as employees are motivated to perform at the highest level when they have a direct financial interest in the enterprise. Options or share gifts/purchases enable the employee(s) to acquire stock in the company at less than fair market value with the goal of selling them at some future date for a profit. Company stock acquired in this fashion is considered a taxable benefit by the Canada Revenue Agency; however, if the company is a Canadian Controlled Private Corporation the benefit is not declared until the options are exercised or the stock or sold. For example, as a bonus for superior performance you give your best salesperson an option to buy 1000 of the company's shares at $5 per share. A few years later the salesperson exercises the option to purchase the shares at $5 per share but the shares are now valued at $10 per share. In this case the salesperson has earned $5000 on the share appreciation and must declare the $5000 as employment income. The employer will need to record the $5000 as a taxable benefit on the employee's T4 slip for the year in which the option was exercised. If shares are given to the employee directly or discounted via a share purchase plan the taxable benefit rules also apply. This can be deferred until the shares are sold though and if the shares are held for at least two years the employee can claim a 50% deduction on the benefit. Business use of a vehicle - an employer may reimburse an employee for using their own vehicle for business purposes, provided you follow the CRA's Reasonable per-kilometre allowance guidelines. Non-reasonable per-kilometer rates will be considered a taxable benefit. Payments for travel expenses (such as meals) for activities conducted on behalf of the business. The employee must keep track of the expenses and submit an expense report (with receipts) to the employer. The employer may give the employee an advance for expenses.